Want to go to the first round of Formula Drift but don’t have the scratch to make the trip? Well Alpinestars, Need For Speed SHIFT 2, and Tilly’s have teamed up together to help you out. 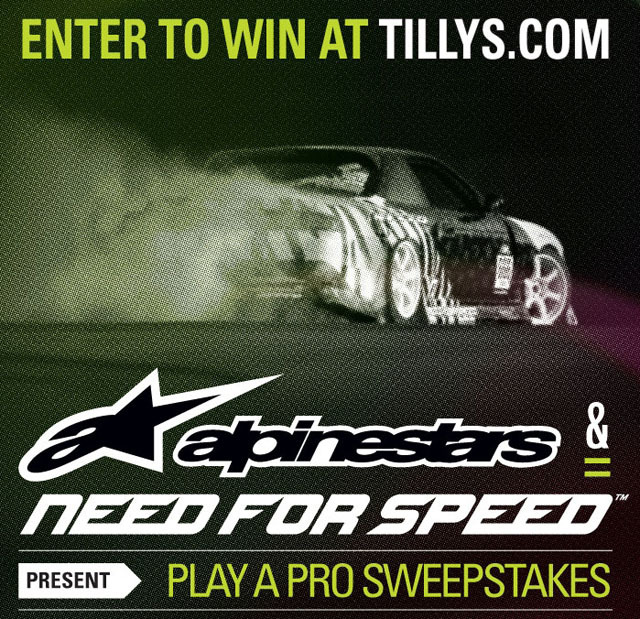 If you visit a Tilly’s store or go to the official contest website you can enter to win a trip to Formula Drift Long Beach, get a ride along with team Need For Speed driver Matt Powers, gain VIP access to the Need For Speed hospitality area, and play Need For Speed SHIFT 2 before anyone else with Vaughn Gittin Jr.! If you think fate is on your side then you definitely need to enter this contest ASAP. If you don’t win then…well ok there is little consolation but hey there is always the driftstream and gamefly! ← @Volkswagen Super Bowl XLV Ads: Fresh? Wack? Or Meh?